August is a busy month, with teaching in the studio and sometimes off-site, preparing for several fall and holiday shows (including a studio tour), and the annual Artist-in-the-Schools Booking Fair. Lots of performing and visual artists are brought together to present their programs to school representatives. It’s a long day but the Fair is wonderfully organized by the United Arts Council of Wake County and it runs like clockwork. I’ve been an artist-in-the-schools for about 10 years. Currently I’m mostly in Wake County, NC (the Raleigh area). Since my formal education is in biology and I took a lot of anthropology classes in college, I like to create programs that integrate art with science and social studies. I also incorporate, where appropriate, math, chemistry and technology. When talking with a school representative, I find out his/her goals and objectives and suggest several possibilities for programs. We meet again about a month before the workshops or residency. At that time, I show models I’ve made for the project and we refine our ideas. Then I send a lesson plan. Some past projects: Face jugs, animals of carious biomes, self-portraits…. At the Booking Fair, I set up a station where anyone can make a little something in clay. 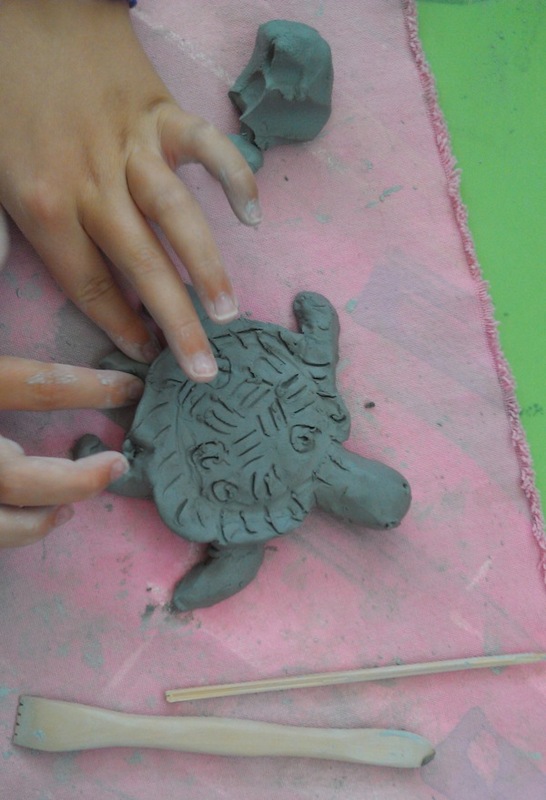 Soon after the Fair starts, the clay table is full with several students creating anything they can imagine. I don’t get to help them much, since I’m usually talking with the school representatives, but they get to have fun. Here is one of the masterpieces. There is a page on this web site with information on my artist-in-the-schools programs and I hope you will take a look at it!